Maybe it’s the Minnesota in me but I have a soft spot for wild rice soups. 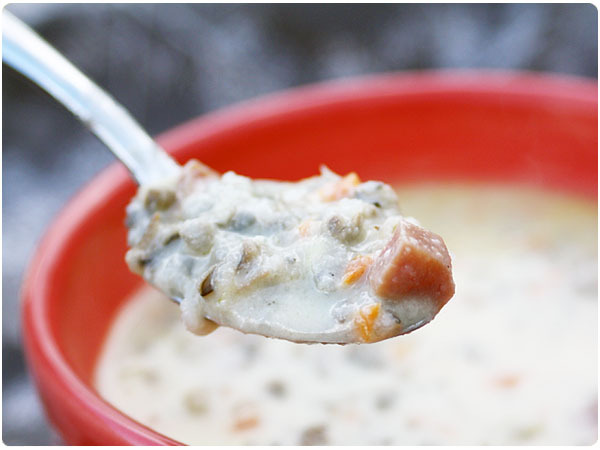 Growing up we used to frequently have this homemade Wild Rice Soup, adapted from the cafe/deli version served at Twin Cities gourmet grocer, Byerly’s. It came to me via my mom via her friend and I’ve slightly modified it to my liking so it’s strayed from the actual Byerly’s recipe I’m sure but it’s certainly a great stand in. It’s great for a hearty weekend supper or even a casual dinner party. In a large pot, cook wild rice according to package instructions. Wild rice takes about 40-50 minutes to cook, so you’ll need to account for this time. Rice can be slightly al dente but should be mostly cooked. In a stock pot, melt butter over medium heat and saute onion until onion is tender. Slowly whisk in flour to thicken, adding small amounts of the chicken broth if needed to create a thick roux and prevent from burning. Gradually add remaining stock, whisking until smooth. Stir in cooked rice, ham, mushrooms, carrots and almonds and bring to a boil. Season with salt, adding 1 tsp at a time until flavors pop. Simmer for 10 minutes. Add half & half and sherry and stir to combine. Season with additional salt if needed. Simmer for 1-2 hours. 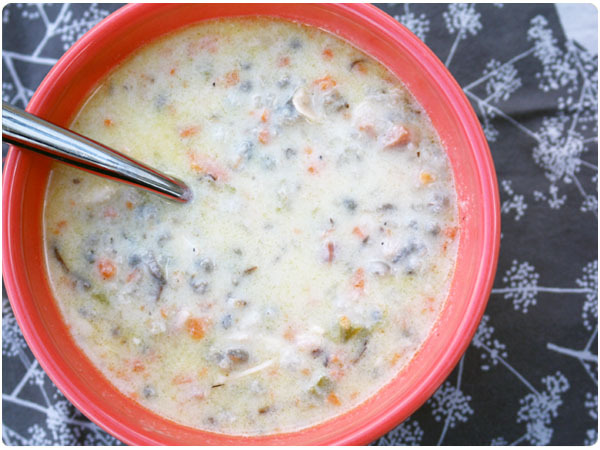 My husband is from Minnesota and I never grew up with wild rice soup…and now it is one of my favorites. I’ll have to try this recipe!